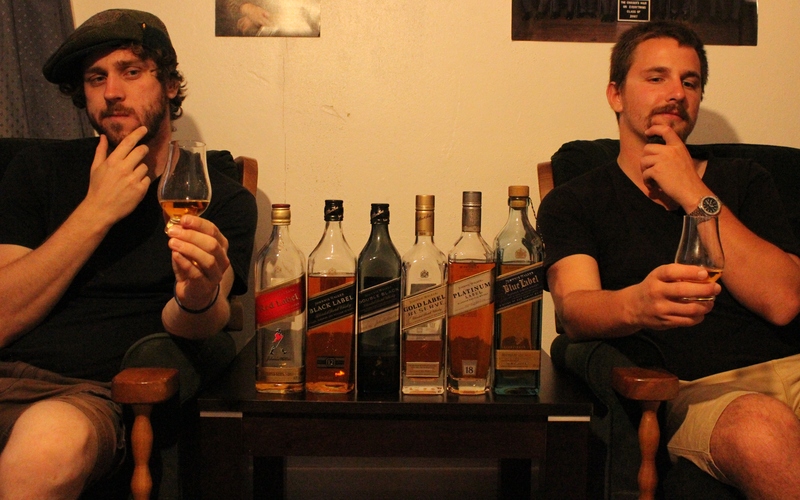 The Whisky Wafflers are chuffed to announce their first ever ‘event week’! Over the next seven days they will be sampling each of the main expressions of Scotland’s most famous and renowned blended whisky. I am of course referring to: Walkers Kilmarnock Whiskies! What’s that? It’s not called that these days? Well what is it then? Oh. I see. I stand corrected. I am of course referring to: Johnnie Walker! If you are a Scotch whisky drinker, it’s likely that at some stage in your life, you will have tried a Johnnie Walker product. If you are not a Scotch whisky drinker, it’s even more likely that at some stage in your life you will have tried a Johnnie Walker product – and it put you off. Regardless, be sure to tune in over the next seven days for our light hearted and occasionally tongue in cheek opinions of all six main expressions, as well as the story of our darkest whisky drinking day. With all that and more coming up, be sure to visit the page over the next week and find out exactly what we think of the best selling whisky in the world!